eBroadcast was first to market in 2011 with the introduction of booking facilities for Australia's Event Cinemas, integrated into both the eBroadcast network and syndicated API partners. 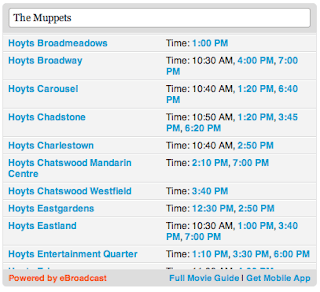 This week we are creating another Australian first with the inclusion of further booking technology into the eBroadcast API for two more movie giants - Hoyts and Palace Cinemas. This expansion now enables many more lovers of cinema to enjoy one-stop booking features on the eBroadcast network and our syndicated API partners, whilst providing more venues with exciting new platforms to directly sell tickets. 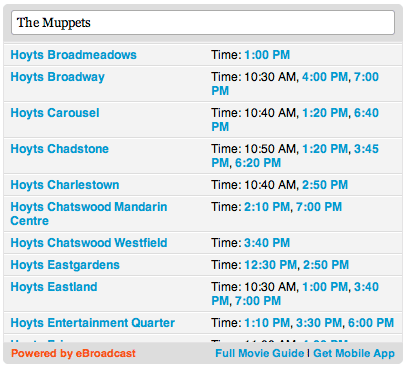 Check out the Australian Movie Guide at eBroadcast to test drive the new ticketing technology. Organisations interested in licensing our API for their publication can contact us here. eBroadcast will be announcing ticketing technology for more venues soon.